Watch the discussion to the end – see Penny Nance challenge Planned Parenthood spokesperson Erica Sackin to denounce late term abortions up to birth. No shock that tax funded Planned Parenthood refuses to say it should be illegal! 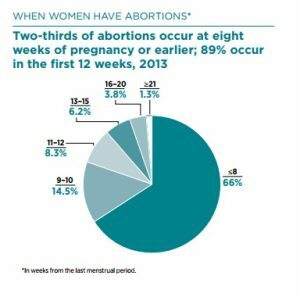 Women with one or more previous induced abortions accounted for 43.6% of abortions. Women with no previous abortion accounted for 56.3% of abortions. Women with three or more previous abortions accounted for 8.2% of abortions. Abortion rate of 6.8 abortions per 1,000 women aged 15–44 years. Abortion ratio: 111 abortions per 1,000 live births. Abortion rate: 25.1 abortions per 1,000 women aged 15–44 years. Abortion ratio: 390 abortions per 1,000 live births. Abortion rate: 11.2 abortions per 1,000 women aged 15–44 years. Abortion ratio: 147 abortions per 1,000 live births. According to these numbers, 8.9% of children aborted in 2015 — 38,183 — were past the first trimester of pregnancy. California, Connecticut, the District of Columbia, Florida, Illinois, Maryland, Massachusetts, New Hampshire, New York State, Pennsylvania, Wisconsin, and Wyoming did not report abortions by gestation. Guttmacher gathers its figures from surveys which it claims it sends directly to all known abortion facilities, categorized by type. The new data also demonstrate the weak abortion-reporting requirements in the U.S. The CDC doesn’t have the authority to compel states to report abortion numbers and as a result, unsurprisingly, the data are incomplete.California, Maryland, and New Hampshire all failed to report abortion data for 2015. In fact, California has not reported any abortion data to the CDC since 1997. What’s more, while the CDC has already released 2017 data on a range of public-health topics, its abortion numbers are far behind; there is almost always a lag of more than two years before abortion data is released. Although Guttmacher has not yet released data for 2015, reported abortion numbers published by Guttmacher in 2014 showed that 926,200 were reported, and revealed that more than 100,000 abortions took place in the 2nd and 3rd trimesters. This reveals a stark difference between CDC and Guttmacher data. According to the CDC, an abortion is defined as legal only “if it is performed by a licensed clinician within the limits of state law.” It is unclear how CDC will calculate so-called “self-managed” abortions currently being pushed by the abortion industry. 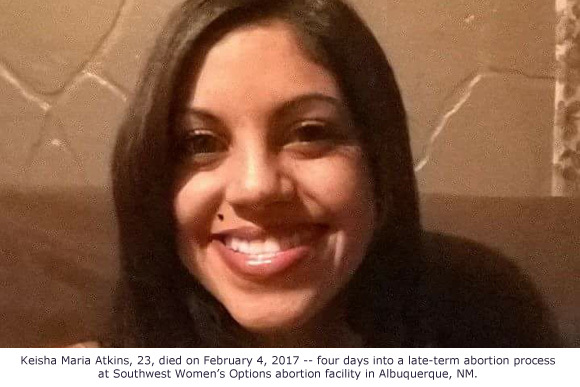 Pro-life groups previously discovered the death of one of those women from 2014. 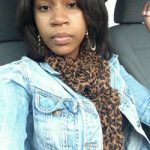 Lakisha Wilson died from cardiopulmonary arrest during a legal abortion at Preterm in Cleveland, Ohio. Women are frequently told that when abortions are legal, they are also safe. Unfortunately, abortion consent forms the industry requires women to sign show this is not always the case. Abortion complications — including those resulting from the abortion pill — are only required to be reported by about half of U.S. states. While the trajectory is heading in the right direction, there is still much work to be done to make abortion unthinkable and return protection to persons in the womb. These are historic lows since the year following Roe. CDC Abortion Surveillance report from 1973 indicates that a total of 615,831 legal procedures were reported from 50 states and the District of Columbia and New York City. 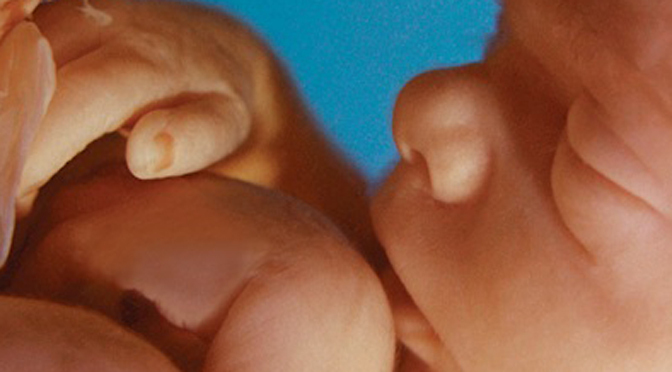 The abortion industry would like the public to believe that babies born alive after abortion attempts rarely occur. However, research shows that the so-called abortion live-birth dilemma has been haunting abortion profiteers since the days of legalization. April 1973, Greater Bakersfield Hospital, Bakersfield, Calif.: A 4 1/2-pound infant was born live following a saline abortion (induced by an injection of salt solution) performed by Dr. Xavier Hall Ramirez. Informed by phone, Dr. Ramirez ordered two nurses to discontinue administering oxygen to the baby. His instructions were countermandated by another doctor; the baby survived and later was placed for adoption. This above case was one of many highlighted by the Philadelphia Inquirer in a 1981 series entitled The Dreaded Complication. A young resident was the first doctor to arrive. After detecting a strong heartbeat, she took matters into her own hands. She clamped the umbilical cord and sent the baby to intensive care. 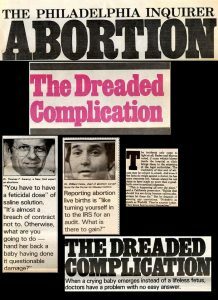 In 1989, Pennsylvania abortion doctor Joseph Melnick was convicted of infanticide after it was proven that a baby he aborted survived the abortion. Hospital staffers where the abortion occurred said that they had detected a heartbeat and saw the baby move and gasp. For this crime, Live Action News contributor Sarah Terzo reported that the judge gave him no fine or jail time – only probation and community service. By the 1990’s additional incidents of babies surviving abortion were being reported. In Florida, Miami Right to Life documented the case of a 23-week-old male with Down syndrome, who pro-lifers endearingly named “Baby Special,” after they were contacted by an anonymous caller who claimed she worked at the hospital where the incident occurred. The witness also called the police, telling them that the doctor smothered the baby after it lived through the abortion process. The report, which was published in the Miami Right to Life’s newsletter just after the incident, said that the medical examiner testified that the autopsy found pockets of air in the baby’s stomach and that the child had taken a breath. 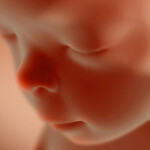 “When a fetus is aborted, sometimes there is some activity in the fetus and you normally don’t do anything. You let the fetus expire. 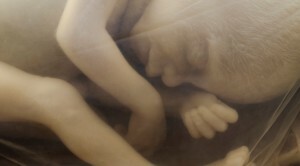 The usual thing is just to take your time, don’t immediately do anything,” the abortionist told authorities. Authorities cleared the doctor saying there was no clear evidence that he smothered the baby. In 1993, a New York abortion doctor was convicted of performing an illegal third-trimester abortion which resulted in him severing the arm of a baby which survived his abortion attempt. The public was horrified by the story, causing the abortion doctor, Dr. Abu Hayat, to be nicknamed the Butcher of Avenue A. The baby’s 20-year-old mother, Rosa Rodriguez, was estimated to be about eight months pregnant when Hayat began the $1500.00 abortion procedure on her. 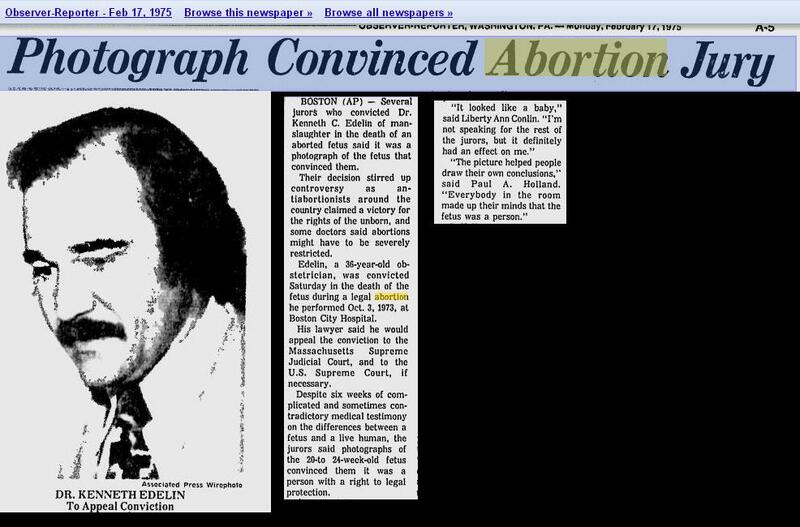 According to the Daily News, Rodriguez described being strapped in stirrups and held down by Hayat and his assistants while she begged him to stop the abortion. 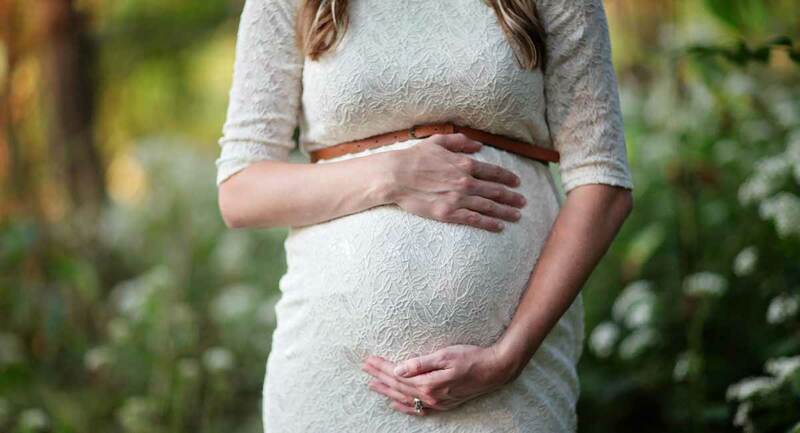 She testified that she no longer wanted the abortion after Hayat inserted a four-inch needle in her stomach that appeared dirty, and she began hearing women in other rooms screaming. Hayat was found guilty of assault on Rosa Rodriguez and her baby Ana Rosa. After the incident, pro-abortion talk show host, Phil Donahue had the child’s mother as well as the injured infant as a guest on his television show where he described the horror of the incident. Despite the fact that Hayat practiced legally, Donahue attempted to spin the story as unrelated to the abortion issue. The truth is that every day, infants are ripped apart limb by limb during abortions – but the majority are not born alive. In June of 1993, abortionist Abu Hayat was sentenced to prison but was released on parole in 2006. He was discharged from parole supervision in 2009 and his sentence has been officially deemed completed. He tried to have his name changed but a judge refused his request to do so. 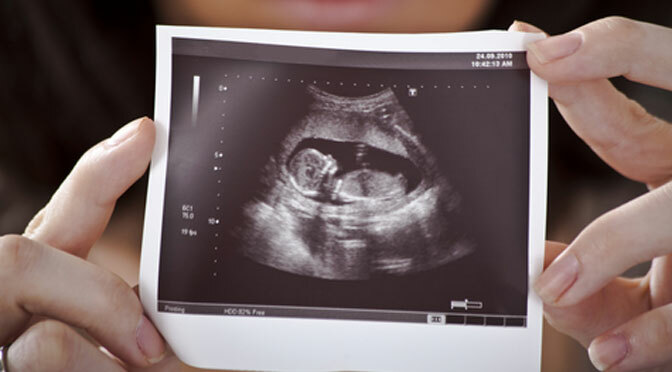 Doctors who perform late-term abortions or any abortion for that matter, often convince themselves that a preborn baby is not a person. This distorted view then is easily transferred onto the child if they survive the abortion attempt. An example of this was seen in an interview with late-term abortionist Kenneth Edelin. 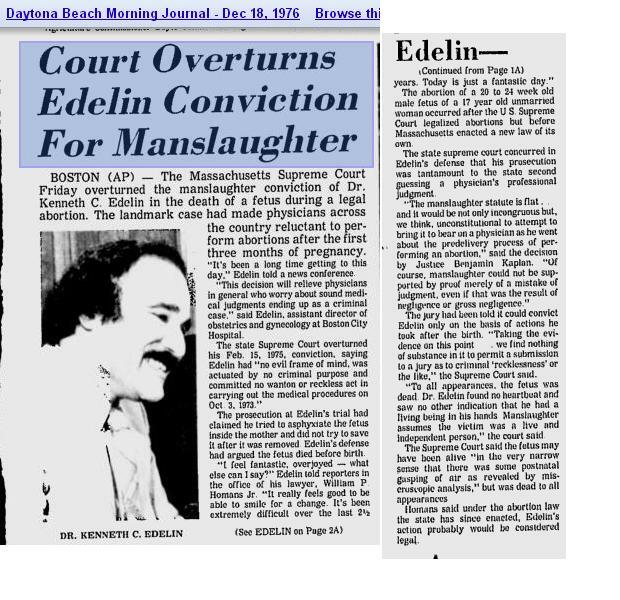 In the early 1970’s Edelin was charged with manslaughter in the death of a 20 to 24-week old baby boy after an abortion. The prosecution claimed that the Boston abortionist tried to asphyxiate the child inside the mother during a C-section type abortion procedure. The abortion, which took place in 1973, began as a routine procedure: the injection of a saline solution that usually causes uterine contractions and the expulsion of the fetus. But several tries were unsuccessful, and Edelin completed the abortion by a surgical procedure known as a hysterotomy — making a small incision in the uterus, like a cesarean section, and detaching the fetus from the placental wall by hand. A photo of the child preserved in formaldehyde was shown to the jurors. The photo was called inflammatory by the defense, but it had already had an effect on the jury. Edelin’s lawyers argued that since the child was in the uterus, a “person” had never existed, so therefore a person had never died. Edelin was convicted, but it was later overturned. Edelin, who died in 2013 has been called a hero by Planned Parenthood. Perhaps the most famous abortion survivor is Melissa Ohden. In 1977, Ohden survived a saline abortion at seven months gestation. In 2012 she formed The Abortion Survivors Network and now works to educate the public on the realities of abortion and how often babies survive the attempt on their lives. Gianna Jessen also survived a saline abortion and has shared her survival story through speeches and testimonials before the government. Abortionists don’t want people to know that babies survive abortions, but each of these individuals proves that life really does begin before birth. It is the duty of each of us to respect those lives and allow them the right to be lived. This was republished from Operation Rescue, the original post appeared here. A newly released undercover recording captures a late-term abortion facility staffer telling a “healthy woman posing as 25 weeks pregnant” that they will “euthanize the fetus.” The disturbing recording was released by Abortion Free New Mexico and Priests for Life, and was published by the New Mexico group, Pro-life Witness. The undercover phone call was placed to Southwestern Women’s Options (SWO), an Albuquerque, New Mexico, late-term abortion facility operated by infamous abortionist Curtis Boyd. The basic information sought by facilities like Southwestern Women’s Options is how far along the woman thinks she is and whether or not she can pay. 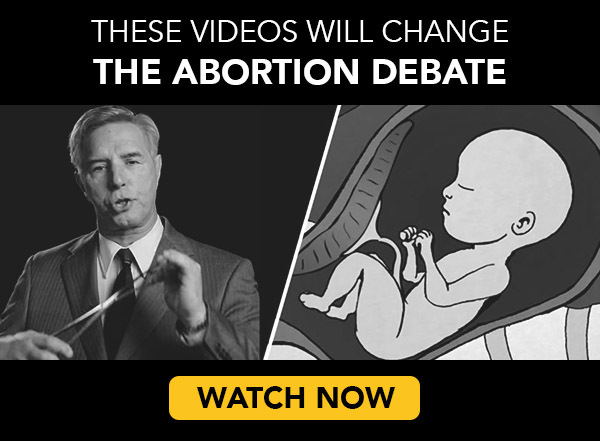 Contrary to what the public is led to believe, it is clear from this video — and others — that late-term abortions are not being performed for reasons of health alone. In several states, including New Mexico, taxpayers are funding late-term abortions done for any reason the woman desires. It should come as no surprise, then, that abortionists with the abortion industry’s leader, Planned Parenthood, believe all abortions are “medically necessary” and should be funded by taxpayers. In the video above, one of the first things the facility tells the caller is that if she is able to get to their location quickly (before another week goes by and prices increase further), an abortion at 25 weeks will cost her $8,500. If the abortion industry really wanted to help poor women to have “abortion access,” and “free abortions,” then why are they charging so much? Because abortions, whether paid for by taxpayers or by private individuals, have never been “free.” Despite what the abortion industry might claim, these procedures are (as you can see) quite lucrative. 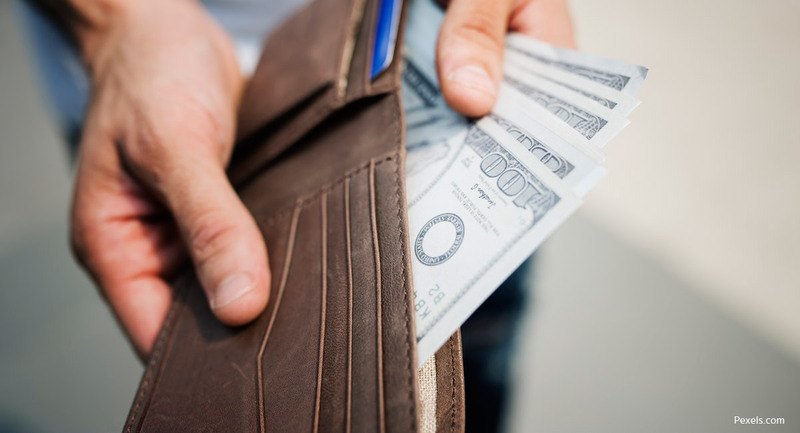 In 2015, a woman who sought a late-term abortion from Colorado abortionist Warren Hern claims she paid $25,000 to end the life of her baby at 36 weeks. More on that case later. In detailing the late-term abortion process, the facility staffer tells the caller that the late-term, 25 week abortion is a “three to four day process” of “labor and delivery” which will produce a “stillborn” baby. On the first day, the doctor, referred to as “she,” will “use a medication.” To do what to the baby, exactly? To “euthanize the fetus” and “stop the fetal heart on that first day,” according to the staffer. 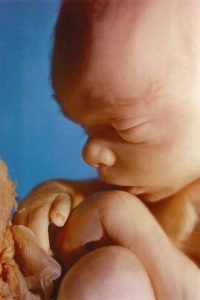 During an abortion in the 2nd trimester, specifically after 22 weeks, it is general practice to perform feticide (injection of a lethal medicine into the amniotic cavity or into the fetal heart) to essentially euthanize the fetus prior to the dilation and evacuation (D&E) procedure. It is therefore not alive once the abortion procedure is started. The role of inducing demise before dilation and evacuation (D&E) remains unclear, except for legal considerations in the United States when an intact delivery is intended. By electing to use an agent with established feticidal properties at a dose and by a route that have been established to ensure cardiac asystole in most cases, there is no intention of performing the banned abortion procedure… [it will] demonstrate the abortion provider’s intention to avoid the banned procedure and allows documentation of the absence of cardiac activity, thus protecting the provider. In the NM undercover video, the caller is given more details of what happens after the feticide is administered to “euthanize” her child. “Labor is going to be induced here in the clinic, usually one to two days later,” the staffer advises. “The doctor will use a substance; it is called laminaria. She will place that in the cervix overnight… and it will very gradually begin to open up your cervix overnight.” Then the staffer tells the caller she would need to stay “close by” in a hotel near the abortion facility. This little bit of instruction is important because the abortion staffer knows that once Digoxin is injected into the womb, the woman could go into what the industry calls “extramural delivery,” which means she could go into labor and delivery before her scheduled abortion. The chances of this occurring increase with each additional laminaria prior to the scheduled abortion, according to a study of late-term abortions at UCLA, published by the Journal Contraception. 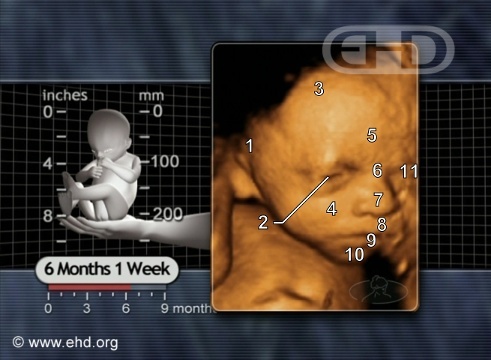 It is a sad reality that babies in all gestational stages are targeted for death in the womb. Human beings at all stages of life are sacred and should not have their lives extinguished at the whim of those who callously profit from their demise.